The 1995 Carlton premiership side was certainly a fine football team. They dominated the home & away season like no team before them, winning a then record 20 games. The Blues then bullied what should have been their closest rivals in the Finals Series, winning their 3 finals by an average of 71 points. So entering the Centenary Football Season as reigning premiers in 1996, the Carlton Football Club had the talent, experience and football pedigree (they were holders of more premierships than any other team) to continue to dominate the AFL. 1996 didn’t work out the way Carlton expected. Finishing the home & away season 5th on the ladder, the Blues were bundled out in straight sets after 55 and 97 point losses to West Coast and Brisbane. Furthermore, after such a dominant 1995 season, few people would have believed that in the following 22 years, not only would Carlton fail to win a premiership; but they would barely mount a credible challenge. The closest they came were from a couple of Anthony Koutoufides inspired seasons at the turn of the century. Of course there have been excuses, in particular the draft and financial penalties as a result of salary cap cheating in the early 2000’s. This combined with poor list management and ill-considered coaching appointments has meant the club is only now emerging from a prolonged period of mediocrity. Under the guidance of Brendan Bolton and with a young talented list, the future is finally starting to look brighter. Carlton’s 22 year premiership drought is a plight not unfamiliar to the yellow and black diehards at the Richmond Football Club. But the experience of defending a title is not. And although Carlton’s demise post-1995 feels like a distant memory, the Tigers of 2018 would do well to learn from their rival's cautionary tale. Nothing is a given in football, no matter how dominant a side looked in their previous season, you’re only ever as good as your next game. There was plenty of soul-searching at Carlton after the humiliating finish to its finals campaign of 1994. The club was astute in its selection of recruits. The resultant new blood, and the coming of age of a number of players who had been fringe selections in the past, combined to rectify the main deficiencies in the Blues game. These included its lack of pace around the midfield, a heavy reliance on a single player - Kernahan - for its goal supply, and an almost total reliance on a small select group of veterans around the ground. A pronounced change of attitude was, however, as important as anything else. There was plenty of soul-searching at Richmond after humiliatingly missing the finals in 2016. The club was astute in its selection of recruits [Prestia, Nankervis, Caddy]. The resultant new blood, and the coming of age of a number of players who had been fringe selections in the past, combined to rectify the main deficiencies in the Tigers game. These included its lack of pace [rectified by the mosquito fleet of small forwards], a heavy reliance on a single player - Riewoldt - for its goal supply, and an almost total reliance on a small select group of veterans around the ground [Martin, Cotchin, Rance]. A pronounced change of attitude [manic pressure] was, however, as important as anything else. As nostalgic as it is to be looking back 22 years, perhaps we should look to more recent history for further guidance on what we should expect from the defending champions in 2018. 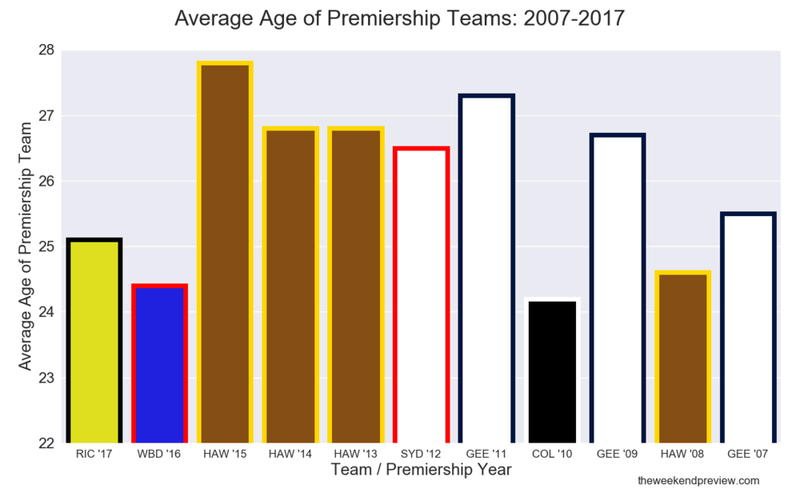 Table-1 presents the age and experience of the premiership teams between 2007 and 2017, as well as their positioning (after finals) the following year. The only team in the past decade to go back-to-back was Hawthorn, which they did twice as part of their 3-peat (2013-15). But that Hawthorn side was vastly more experienced in both age and total games played than the Richmond side of 2017. Talent and maturity were certainly factors contributing to the sustained success of Hawthorn. Similarly, it could be argued that the perennial challenge from Geelong and Sydney over the past decade was based upon a core group of experienced players. Plenty of experts already have Collingwood pencilled in for this year’s premiership. You can understand the theory: The Pies fielded a much younger group than many of their 2010 challengers come finals time, and have more upside, so why shouldn’t the gap widen? But while the future’s so bright, Eddie McGuire’s got to wear shades, there are no guarantees. We all thought Hawthorn was embarking on a dynasty after it won the flag in 2008. The Hawks have not won a final since. Don’t be surprised if Malthouse is ramming that down the throat of his troops all summer. But if you can’t bear to stomach another Pies premiership, you might want to look away and stop reading now. The average age stats are scary. The Pies went into the season as the fifth-oldest team in the competition, but a lot of the older players didn’t play finals. They were more than three years younger than St Kilda [runner-up] and the Western Bulldogs [losing preliminary finalist] in their final game of the season. There appears to be so many players with eight to 10 years of prime football ahead of them… Steele Sidebottom, Dayne Beams, Dale Thomas, Scott Pendlebury, Chris Dawes… the list goes on. There are no retirements on the horizon and even Chris Tarrant, who will slot in nicely for two years down back or even up forward, is a cherry on top of the sweetest of cream pies. It is going to take something special to pip the Pies this year. Maybe a hangover of 1990 proportions is the only hope for all those non-Pies supporters. Of course Collingwood did make the Grand Final in 2011, but they then went on to finish 4th-8th-11th-12th-12th-13th in the seasons that followed. Whilst in contrast, Hawthorn did end up achieving that dynasty – it just took 5 years for it all to come together. Richmond could follow this patient approach, or alternatively they can look to the Geelong side of 2007 that was only marginally older and more experienced than the 2017 Tigers. That Geelong side went on to win 3 premierships in 5 years. I think Richmond would take that. Richmond set a new benchmark for pressure in the 2017 Finals Series. Geelong, GWS and Adelaide all tried to withstand this pressure, but couldn't sustain it much longer than a half of football. Richmond blew away their opposition with 10 goal second halves in each match, ensuring there were no heart stopping moments of doubt for their long suffering supporters. And if their 2018 pre-season is anything to go by, their pressure will be back in full force come Thursday Night. I expect improvement from Carlton in 2018, but this is a tough start. Hansen, B. (1996). “The Blues Files: Volume 1, AFL Season 1996”. Brian Hansen Nominees Pty Ltd, Victoria, Australia. Atkinson, G. (2002). “The Complete Book of AFL Finals, 2002 Edition”. The Five Mile Press Pty Ltd, Victoria, Australia.